I am a member of the Collective Bias® Social Fabric® Community. This shop has been compensated as part of a social shopper amplification for #CollectiveBias and its advertiser. No rainbows were harmed in the drafting of this post. Momma Told Me: Don't play with your food! Before Willy Wonka ever made his technicolor debut, I was reading Roald Dahl's imagining of the candy filled confectionery and imagining myself an Oompa Loompa in an alternate universe. For much of my childhood I could have very well been Violet Beauregarde or the blueberry imposter Veruca Salt. Okay, so I had much better manors, but I'd also wager a number of good behaviors and chores for a single piece of candy. 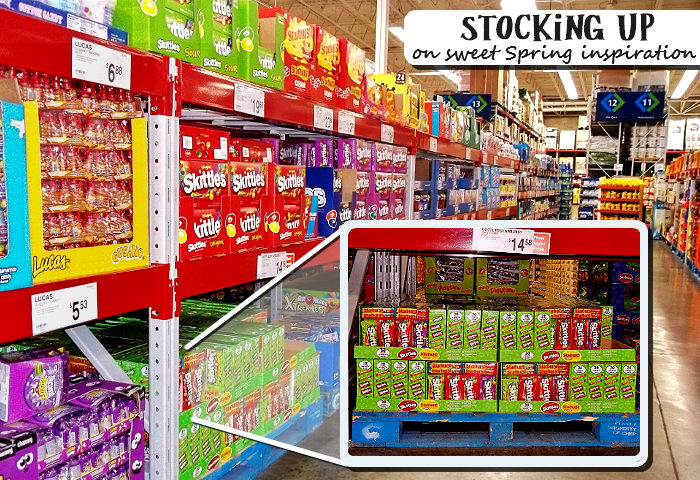 It's no secret I love sweets, and few candies match my equally vibrant love of color as well as fruity and chewy Starburst or the rainbow delicious #VIPFruitFlavors of Skittles. In fact, somewhere around age ten I decided that I would amass the world's largest candy wrapper collection (much to Momma's clear chagrin.) For several years I carefully refolded wrappers and candy packaging and tucked them away in an ever-growing box. One school year I noticed a large number of Starburst candy packs being sold, and the tiny individual chew wrappers floating across our campus. It was then I first decided that crafting with candy was not only delicious but practical. Taking a technique from Momma's teenage years, for gum wrapper chains, I soon began collecting leftover wrappers from staff and students. Before long I had a 5 1/2' Starburst wrapper chain that doubled as a jump rope! As these things tend to go, I eventually grew out of my fascination of crafting with candy, and the subject was long forgotten, until a recent inspiring shopping trip. Sabrina (11) was asking if we could invest in a Skittles & Starburst 30 Pack from Sam's Club. And, by invest, I mean 'devour.' The parent inside me opened it's mouth to blurt "No way kiddo!" but the wrapper folding, color loving, child began to tug on my inner ear. What if I could show Sabrina that playing with your food can not only be fun, but also productive? 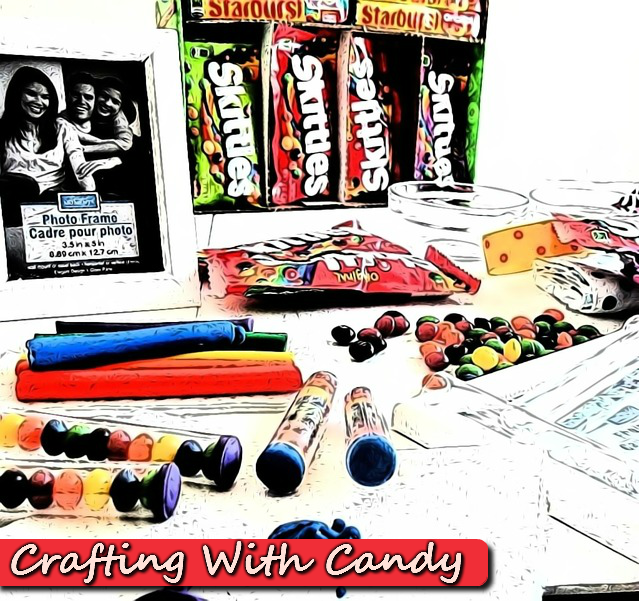 We had several teacher's appreciation events coming up and, with spring around the corner, I decided Spring Break would be the perfect time to dabble in crafting with candy again. 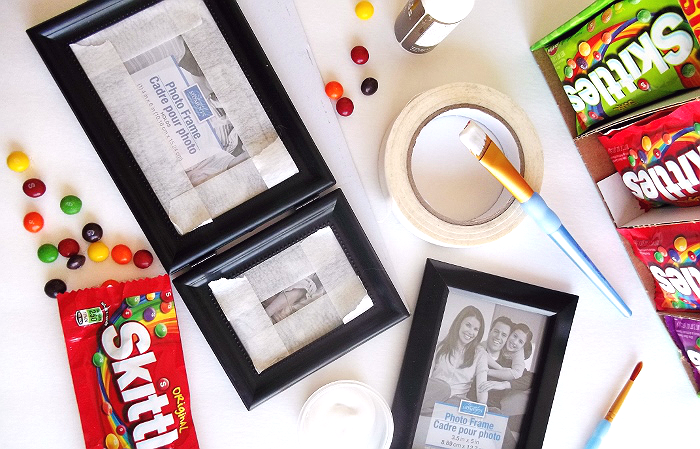 My first project was one that could double as a Mother's Day gift, or Teacher's Appreciation (May 6th); Skittles Picture Frame Craft. This project could easily be achieved with some 'dollar store' or thrift store picture frames, clear candy (or test) tubing, white paint, scrap fabric, a hot glue gun, and modelling clay. 1.) After painting our black frames white with a few generous coats of acrylic paint, I carefully marked the plastic test tubes for a length that would easily interlock along the outside of the frame's natural grooves. Most plastic candy tubing can be purchased cheap online and easily cut with heavy duty scissors, while plastic 'test tubes' like the ones we had leftover from Summer Science Camp, will require an adult's steady hand and a band saw or box cutter. 2.) 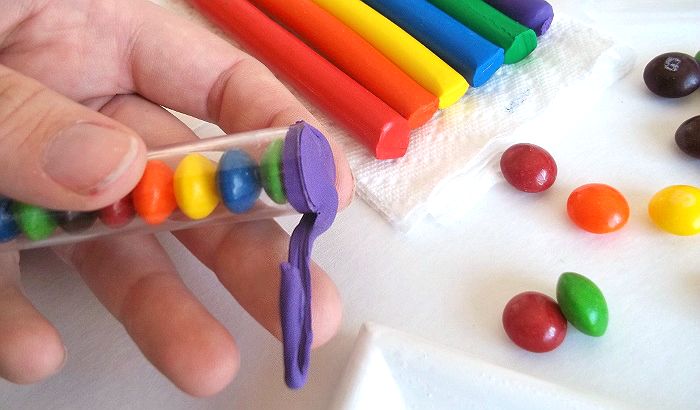 Once our tubes were measured, we layered our Skittles in the desired pattern, right up to the top of the tubes. I especially loved that, between the Original and Wild Berry Skittles, we had a complete 'rainbow' of colors. Once our tubes were full we pinched off come modelling clay and capped off the ends by pressing it down and along the edges. 3.) 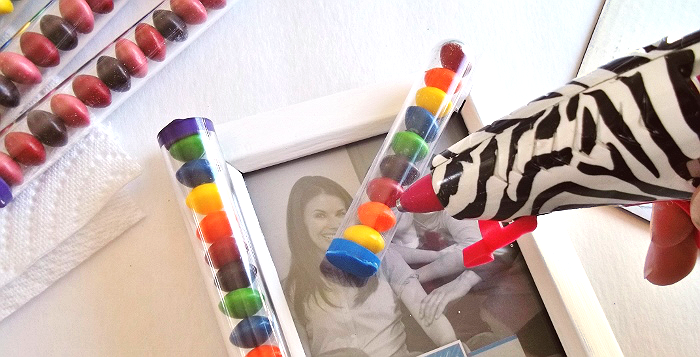 Next it was time to glue the completed candy tubes onto our painted picture frame using a hot glue gun. 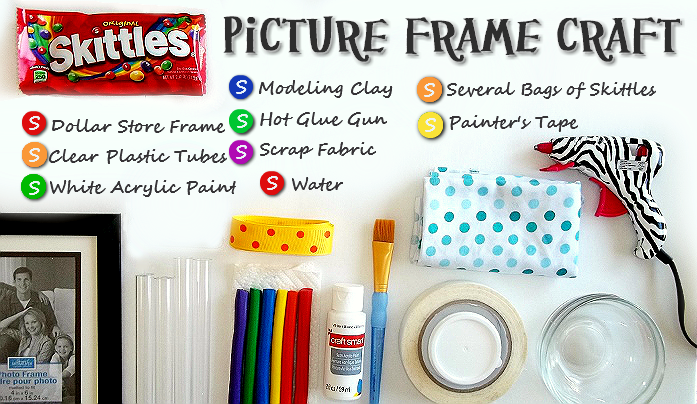 But don't eat those extra Skittles yet- they can be used for fabric dye to create a few extra accents to dress up your frame! 4.) While you can easily dissolve the colored candy coating off these fruity candies with water alone, I use a vinegar ratio, much like dying eggs, that helps to set the color on a new surface (fabric). Separate your leftover Skittles by color, placing 10-12 of each color desired into a small bowl. Add 3 TBS Water to each color 'pot' and 1 TBS White Vinegar. The color will begin to separate from the candy immediately, and you may even see a few magical white 'S's floating in your new dye concoction! 5.) Making dye with sugar coated candy is a fun and safe craft for the entire family, and can be applied to many different craft projects- However, in this case we used it to dye some scrap fabric to make a tiny bow accent for our frame. Sure, it may not be the most vibrant dye job, but it's certainly effective! We especially enjoyed twisting up the corners of fabric and dipping the tips into different colors to make a 'tie-dyed' effect. Besides, I think it's pretty cool to know there's more than just candy IN the frame, but ON it as well! By the time I'd magically made the last few Skittles disappear (in my mouth), and tossed the leftover clay, I was feeling pretty proud of myself. But there was a part of me that wanted to make a gift where people could also enjoy eating the candy as well, so I turned to my old friend, Starburst. It was at last time for me to pass on the art of wrapper folding to Sabrina; and I would also teach her the skill of creative presentation as well! Our first task was to unwrap ALL the Starburst in our 30 Piece Variety Pack. 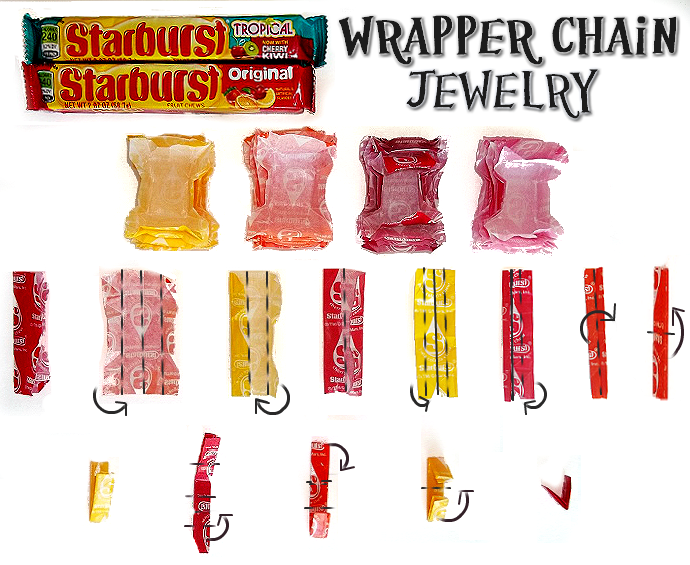 Approximately 1 (12 PC) Starburst pack will yield 4 inches of wrapper chain. Of course we weren't going let all those deliciously juicy and fruity, chewy, candies go to waste! I happened to have every crafter, and bakestress' best friend, the mason jar, on hand. 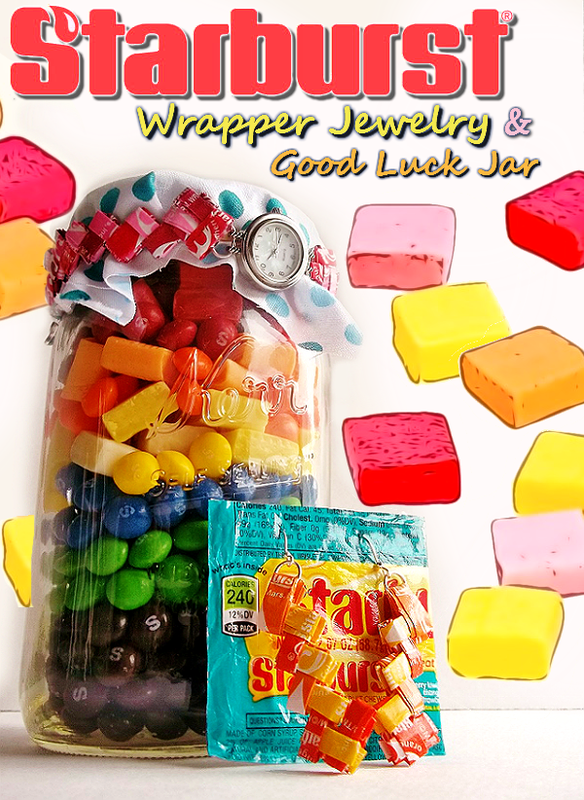 We carefully layered leftover Skittles (for our Purple, Blue, and Green), followed by unwrapped Starburst to create a rainbow effect, then topped with a few gold foil wrapped coins to create a Good Luck Jar display for our soon-to-be candy wrapper jewelry. 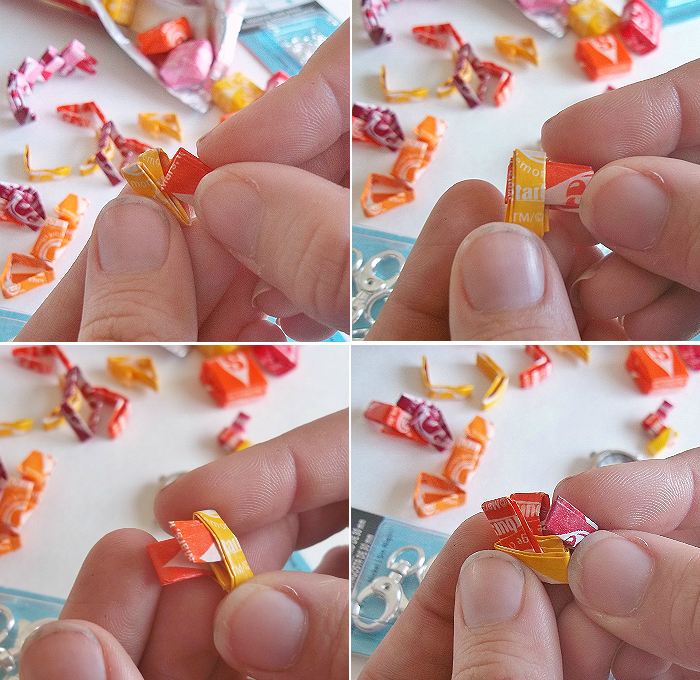 To create a successful Starburst Wrapper Chain is actually much simpler than it looks. Once you have gotten a few links under your belt, you're sure to be folding them without even looking, in no time! 1.) Lay a wrapper down on a table, blank side up. 2.) Fold the wrapper in half and crease. Open the wrapper back up and fold the outer edges in to meet the middle crease. 3.) Fold the outer edges in towards the center crease one more time. Fold the wrapper in half, horizontally. 4.) Fold the wrapper in half vertically and crease. Open the wrapper back up and fold the outer edges in towards the crease. 5.) Fold the wrapper in half, vertically. You now have one link! Making the chain itself is even more intuitive, once you have a few links together, you'll easily assemble a bracelet or lanyard in no time. 1.) Take the two ends of one wrapper link and insert it into the two ends of another wrapper link. 2.) You will note that one side of a link will have several creases, while the other end will only have one definitive crease along the outer edge. This 'clean crease' edge is the easiest to insert your next link into. 3.) Arrange each link with the bend of the link fold pointing towards incoming ends. Continue weaving the links into one another, between the folds you have created when folding the links. 4.) Closing the chain, to make a continuous bracelet or belt will require opening up the last inserted link and feeding the 'folds' into the loop of your first link to recreate the folding process achieved by weaving the links. This requires a little more advanced skill and is often overcome with a daub of hot glue. People use wrapper chains for a variety of crafts and decorations. When I was a young girl my pure intent was to see how long I could make my chain. I've since found a simple beauty in re-purposing the wrappers for colorful jewelry. With a pair of jewelry pliers and some basic chain links and grommets (found at the local craft store) I can easily add clasps, watch faces, earring hooks, and more! We invested $6 in the simple silver finish timepiece above, and used an extra wide lobster clasp to turn two strands of Starburst chains into a wristwatch for Sabrina's teacher. I happen to know this woman also loves fun and funky accessories the kids enjoy, so we put some dangle earrings on a loop and wove it into some spare chains to match the watch. Crafting with candy is a great way to get children interested in art and project-making, and the perfect guilt-free way to indulge in a little extra fruity goodness. I know we will have several happy teachers in the teacher's lounge thanks to our Good Luck Jars full of #VIPFruitFlavors, and the frames will look adorable on office desks this coming Mother's Day! I'm also looking forward to experimenting with candy fabric dye some more this Summer, when we have the younger kids around to enjoy learning about color combining and primary colors. 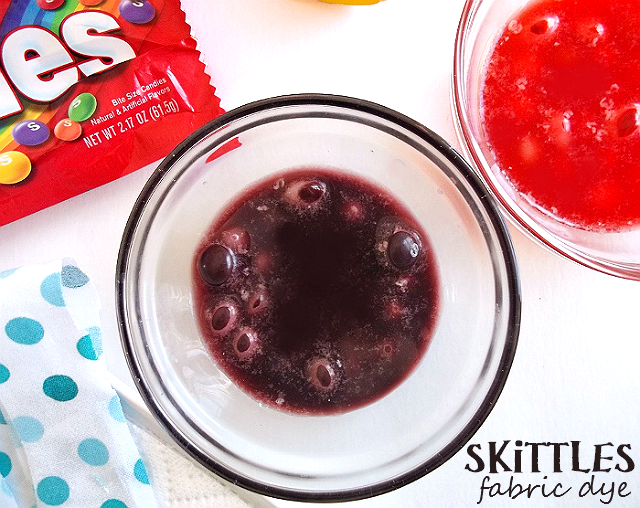 We might even try making this blogger inspired Skittles candy wreath! Have you ever made anything with candy before? What Daughter Says: Bring a little extra color to someone's day with handmade gifts featuring candy! You amaze me. These are both brilliant ideas. Although knowing myself as I do I wouldn't be able to do anything but gobble the delicious Skittles and Starburst candies. And THIS is why I love blogs. Where else would I ever find such a cool craft with perfect directions? Such a fun way to use candy!! Jenna, you are awesome. Plus you are the only person I know who has a zebra-print hot glue gun. 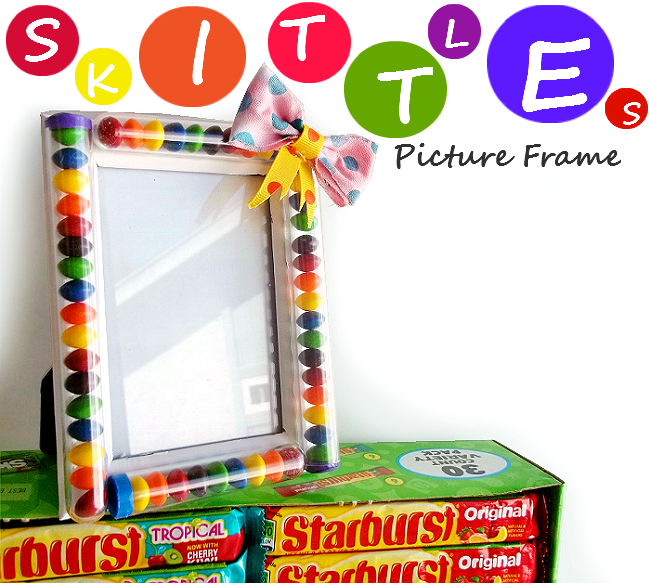 The skittles picture frame is SO awesome, very creative! That picture frame is amazing! I may make that for my nieces birthday. No wonder you get so many projects with SoFab! You're so creative! I've never crafted with candy, the frame is adorable and the wrapper chains are very cool. We'll have to try this sometime. Thanks for all the ideas and great pics/details. OMG I love that picture frame!! That is so cool- I would have never thought of anything remotely as cool as that! Thanks for this!! Jenna, Oh My goodness. Just when I think you couldn't possibly get better, YOU GET BETTER! This was the most phenomenal post on candy I have ever seen! The picture frame was just over the top. What a fun post! Love the frame... and I can imagine keeping my kids busy for hours building that jewelry. All that candy... all that creativity. You made me want to go out and buy massive amounts of CANDY! I love those picture frames. We're doing a candygram theme for Teacher Appreciation Week this year and may be stealing that idea for part of it. How much fun is that? Both of these crafts are amazing and the techniques could be used for so many things! I absolutely love the Skittles fabric dye. What a great set of cute crafts. The earrings and watch band would be fun to do at an Earth Day party! That is the most adorable picture frame! I love the colors! These are cute ideas, I like the picture frame and that it is in tubes, so you won't have any unwelcome visitors...(ants) I remember weaving the starburst wrappers when I was a lot younger and I think I have even seen where people made dresses out of them, thank you for reminding me of them, I will share with with my ptween granddaughters.. I love the picture frame. What a clever idea and so colorful. Now this is an idea I had never considered but I love the idea and will have to give it a try. The Starburst candy jewelry reminds me, these girls at school used to make belts out of gum wrappers and they would write the boy's name that they liked in each wrapper. So at this point you would think they would wear it since that is a lot of work. Apparently, they believed if you then burned this thing the boy would like you back. Weird, huh? I love Starburst! These are wonderful, creative and colorful crafts and they sure seem like a lot of fun to make! We mainly just eat it. Cute picture frame! My kids love starburst. What great crafts can be done with them,and they are yummy too! I think the picture frame is great looking. I always wondered how to make the wrapper chains. I will have to follow your directions. Where did you get the zebra glue gun? These are some seriously cute ideas that i never would have thought of doing! I remember making these chains years ago. You have brought back memories. How fun to do too. I love your picture!! This is a great craft post, but I would never be able to craft with candy, I'd be too busy eating it!! I could definitely make those wrapper chains though, they look great. Thank you for sharing this post. What a fun craft idea! I'd so love to give this a try. I love the watch band! Man,these are really cool ideas! I love the candy wrapper jar. So cool. I remember years ago making candy wrapper chains! It was somuch fun altho I had forgotten how tofold them! I totally love the earrings! Super cool idea! I love this and wow that had to take some time to do those earrings though. They are super cute. 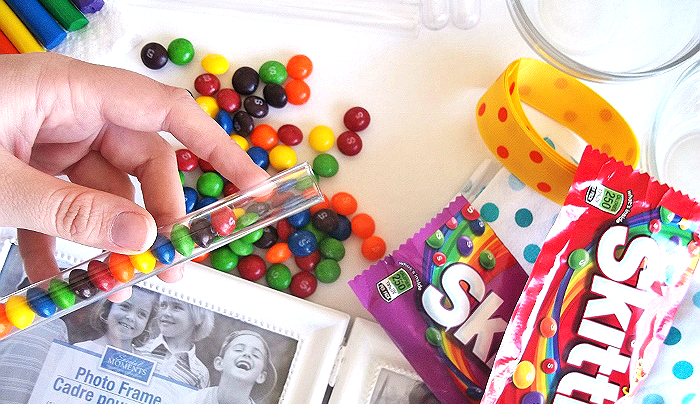 I love the idea of using candy to make crafts. I'm not sure if it would work in my house. 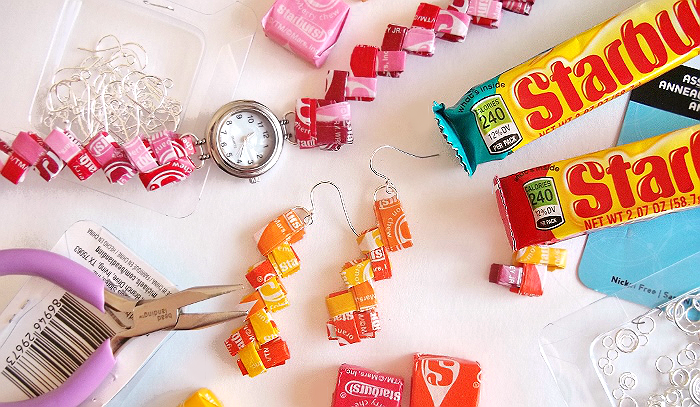 What a fun idea to make crafts with candy wrappers. This looks so pretty. I use to make links out of wrappers too. Yes! This is very cool, fun for kids and also shows them how it's possible to upcycle just about anything and what cool things you can make! I appreciate that you didn't harm any rainbows, lol. I've been curious of the starbust wrapper chains before but didn't think anything of them. I love the ideas you've shared for some projects and definitely will try them! I absolutely love the skittles.